Earth & Iron Inc. has a large fleet of heavy equipment. Our equipment is regularly serviced and maintained to ensure optimum performance. No matter the project scale, we are able to supply premium equipment to handle every unique requirement. 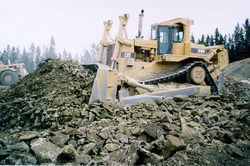 Our current equipment inventory includes: graders, skid steers, excavators, dozers, rock trucks, gravel trucks, logging equipment, scrapers & packers.